1. One reservoir for feeding. 2. One reservoir for flushing. 6. 1/2-inch black poly tubing for header lines. 7. 1/2-inch black poly elbows. 8. 1/2-inch black poly Ts. 9. 1/2-inch black poly end caps. 11. One bucket per pipe to collect runoff solution. 14. 1/8-inch tubing for feeder lines. This system is for growing small plants with 4-inch PVC or plastic sacks filled with a medium like soilless mix, or 70% perlite / 30% vermiculite. The sacks or pipes are hung from the ceiling with chains or rope. The solution is fed into each pipe and the waste runs to the floor or into a bucket. Seedlings can be induced to flower when they are 4 to 5 weeks old. Clones can be induced to flower when they are 6 inches tall. The productive lighting choice is to use three 400-watt lights with 10 to 12 pipes, or two 1,000-watt lights with 28 pipes. A. The sacks or pipes will be 4 to 5 feet in height, which allows 6 grow sites per column. Horticulture sacks can be purchased ready-made or they can be made special order by a plastic company. 4-inch PVC pipe is readily available and much easier to find. B. Plastic horticulture sacks or 4-inch PVC pipe are filled with medium such as soilless mix. Bigger sacks give more area for vegetation to cover. 4 to 6-inch diameter sacks will be fine. 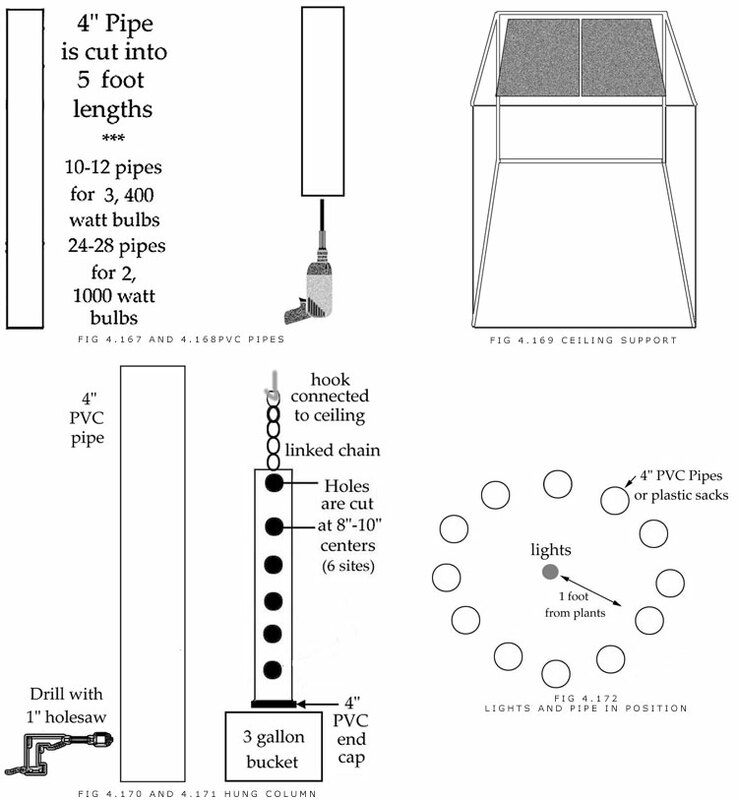 If 4-inch PVC is used, 4-inch PVC end caps should be glued to one end of each pipe. C. Small drain holes should be inserted into the bottoms of the sacks or pipes. With plastic sacks, a nail can make holes. With PVC, a drill and a small 1/8-inch drill bit can be used for hole making. Now is a good time to soak the mix with plain water. Then the pipes can be topped-up with wet mix because the mix will shrink as it gets wet. 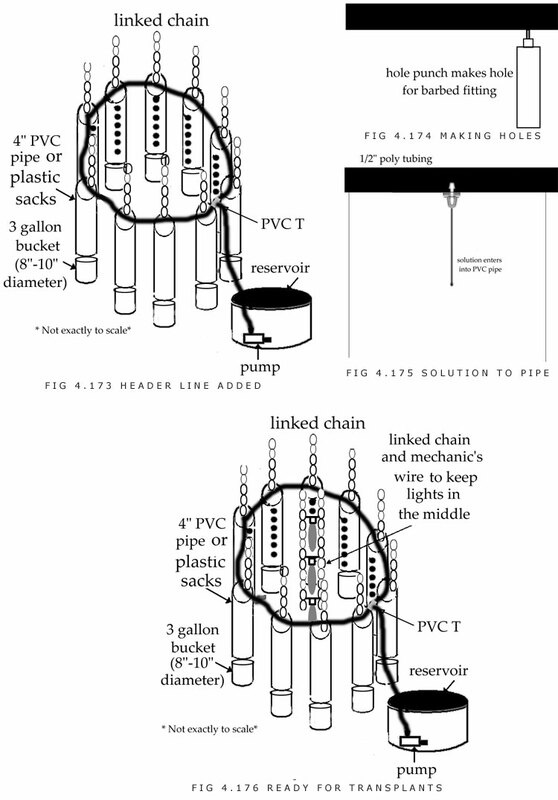 The sack can sit in a bucket to collect the water runoff. D. Two 1/2-inch plywood sheets (or particle board) are nailed into the ceiling to support the system. The plywood sheets are sold as 4×8 sheets. Two sheets will work fine for a 10 to 12 pipe system, or 28-pipe systems in a normal size bedroom. I. 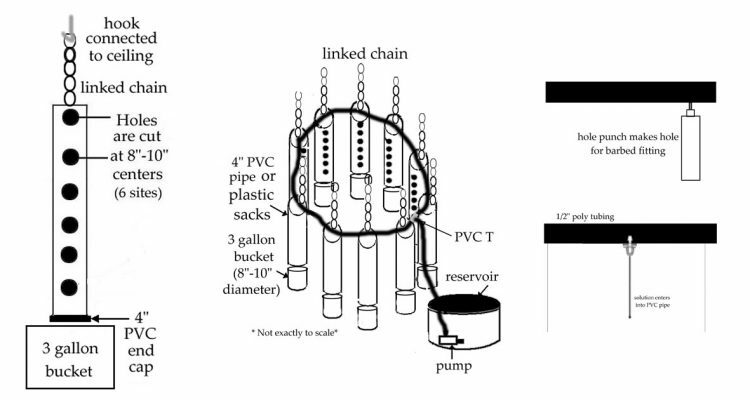 The 1/2-inch PVC T is connected to 1/2-inch tubing, which is connected to a pump in the bottom of the reservoir. A 20-gallon reservoir such as a 20-gallon garbage can will work. Some growers are picky and would use nothing but a high-end, food-grade product. J. A small 1/8 to 1/4-inch barbed fitting is inserted into the 1/2-inch main line above each pipe. This is how the pipes will be watered. Lights are hung in between the plants without hoods. For example, three 400-watt lights can be placed on top of each other in order to illuminate the plants grown in sacks. Plants can be fed once a day for fast, productive growth. Plants will grow fine as long as medium does not dry up. Feeding every few days is the easiest way, but growth will be slower than with daily feeding.